For more than 300 million years, horseshoe crabs (Limulus polyphemus) have left the ocean depths to crawl onshore to breed. In New York, these ancient animals — more related to scorpions and spiders than to crustaceans, and older than the dinosaurs — come to our many shores at full moons, new moons, and high tides beginning in May and continuing into June and early summer. 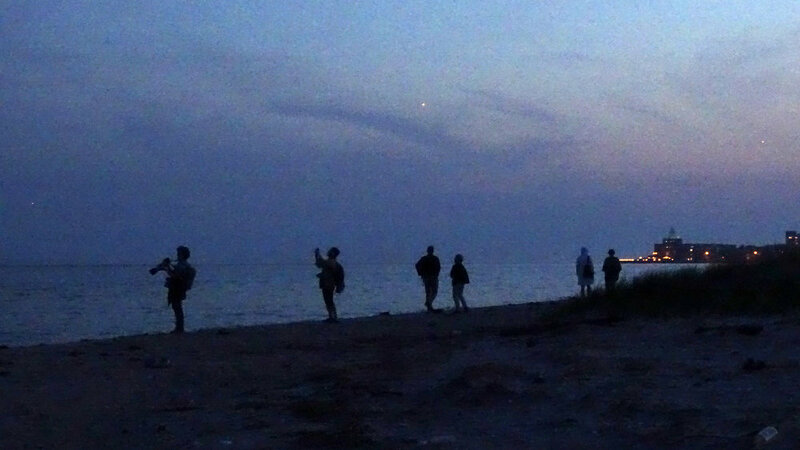 On May 29, 2018, we went to Plumb Beach in Brooklyn close to high tide on a night with a full moon, and were rewarded as the female horseshoe crabs came onshore, with the males grasping onto them. The females dug a nest in the sand and laid their eggs, which the males then fertilized. 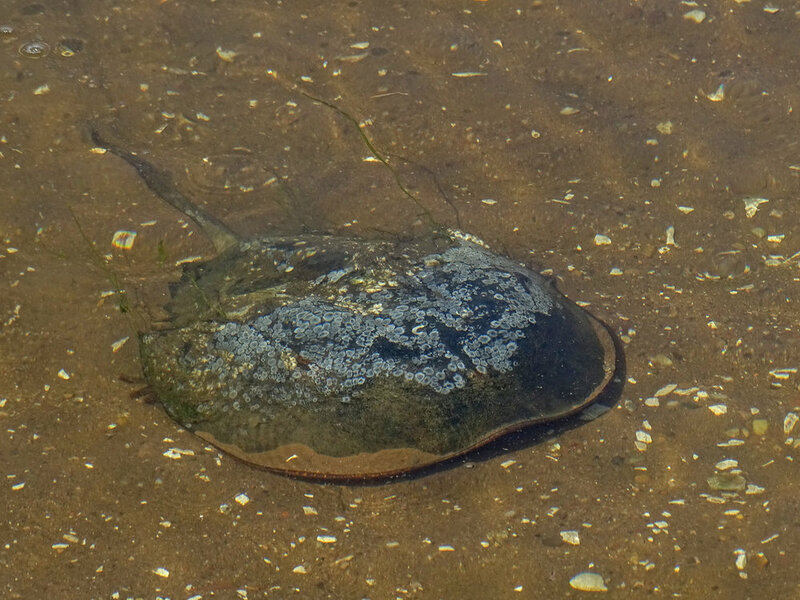 The video showing the horseshoe crabs coming to shore was filmed on May 29 at Plumb Beach, using the soundtrack of the waves. Also in the video are some clips from other beaches throughout the city where I've seen the shells of dead horseshoe crabs, which are beautiful in their own right. Our trip to Plumb Beach was led by Keith Michael of New York City WILD! 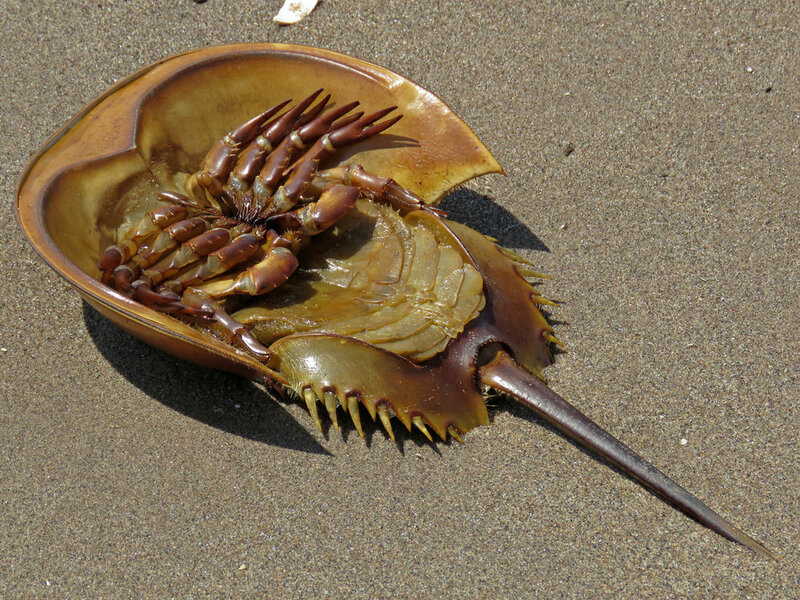 Horseshoe crabs have 10 legs, which they use to walk along the ocean floor. They have hard exoskeletons, and nine eyes spread throughout their bodies, plus light receptors near their tails, or telsons. These long, pointed telsons are not used to sting or poison, but to help the horseshoe crabs right themselves if waves push them on their backs. When the horseshoe crabs were on their backs, rocking back and forth and using their tails to turn themselves over, we watched until we were sure they could right themselves. There were some times when the male and female crabs were both shell down, their legs moving in the air and seemingly without the ability to turn back over. At that point I gently turned the two over and they were able to move again. A horseshoe crab attempts to right himself. The horseshoe crab eggs, tens of thousands of them, are a food source for fish, reptiles, and birds. About two weeks after the eggs are laid and fertilized, those that survive hatch into larval horseshoe crabs, which are tiny versions of the adults but without tails. These youngsters settle on the sandy bottom of tidal flats, where they grow and molt, shedding their exoskeletons and growing larger ones, as they move farther into the ocean depths. Once they become adults, roughly 10 years old, they begin the breeding process.